This Collection Reflects Formal Elegance And Upscale Design. Delicate Leaf Motifs And Detailed Ironwork Compliment The Distinct Crystal Pieces. The Antique Bronze Finish With Gold Highlights Accent The Intricate Detail And Classic Appeal Of The Collection. Combining a classic silver pearl finish with posh styling, the Veranda 6-Light Silver Pearl Semi-Flush Mount Light from Glow Lighting beautifully highlights the charm of your home. This gorgeous centrepiece displays a collection of sparkling glass crystals set against the gleaming finish, creating an eye-catching accent that shines amid your decor. Its compact size makes it a perfect choice for bringing lush, lavish style to smaller spaces. Robust and energy efficient, LED bulkheads are a general-purpose luminaire. Comprised of a die-cast aluminum frame and polycarbonate diffuser. Fixtures are impact resistant and offer various mounting options and can be widely adopted for indoor and outdoor applications. A fashionable black finish combines flawlessly with clear seeded shades, making this Sea Gull Lighting outdoor flush mount sleek and sophisticated, while the energy saving bulbs make it practical. The 75 watt bulbs give off the ideal amount of light for any outdoor application. If you are looking for a bold, new age accent for your home look no further. A fashionable polished nickel finish combines flawlessly with etched / white inside shades, making this Sea Gull Lighting flush mount sleek and sophisticated, while the energy saving incandescent bulbs make it practical. The 100 watt bulbs give off the ideal amount of light for any indoor application. If you are looking for a bold, new age accent for your home look no further. 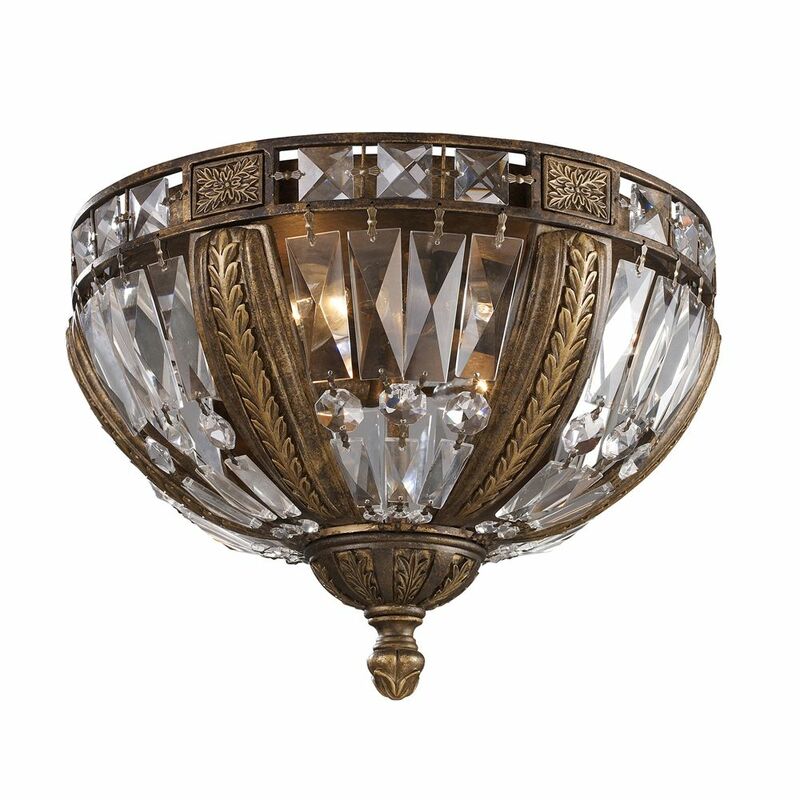 4 Light Ceiling Mount Antique Bronze Flush Mount This Collection Reflects Formal Elegance And Upscale Design. Delicate Leaf Motifs And Detailed Ironwork Compliment The Distinct Crystal Pieces. The Antique Bronze Finish With Gold Highlights Accent The Intricate Detail And Classic Appeal Of The Collection. 4 Light Ceiling Mount Antique Bronze Flush Mount is rated 4.0 out of 5 by 1. Rated 4 out of 5 by Debb from Beautiful Light Light is as pictured. Packaging was perfect - box didn't even have any dings from shipping! Installation ease? Not sure - had electrician do it. Did have to put a bulb in, and that was easy.